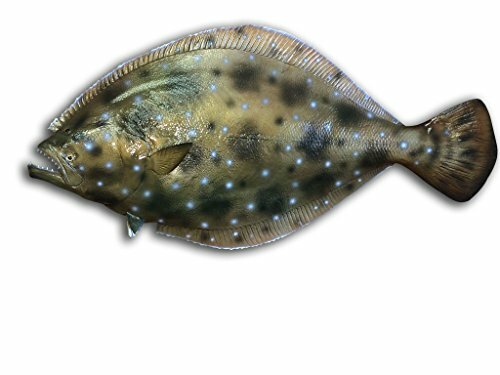 This 35" Flounder Half Mount Fish Replicafish replica is the perfect option for livening up your home, office, or even outdoors. These half mount fish mounts are a cost saver and are hand painted to resemble the real species as if it was alive. Our fish replicas are a great choice when and provide the same level of detail as the traditional full mount. Made of fiberglass and 100% artificial, our replicas encourage conservation. Clear coated with the same UV protectant as your automobile, these half mount fish are both durable and resistant to fading, keeping them vibrantly colorful for years to come indoors and out. Equipped with a hanger on the back for easy installation, you'll be able to enjoy your new fish in no time. Please contact us for any further questions! DISCLAIMER: All length measurements have the possibility of being off by a small percentage since we are fabricating in fiberglass using a grinding technique.